THURSDAY, JUNE 28: Inmates at Westgate gave candid accounts of what life was like behind bars today and claimed ‘prison is nothing like a hotel’. Four prisoners - Anthony Swan, Leroy Symons, Kellan Lewis and Kyle Sousa - spoke of their experiences and life choices in a bid to prevent other young Bermudians following in their tracks. Mr Swan, 24, who is currently serving a 12-year sentence for a series of gun-related offences, said: “It is obvious I made a wrong choice. “My message would be to set better expectations for yourself. “My choice back then was based around my expectation of self. Senator Kim Wilson also spoke at the press conference held at Westgate today. She said Bermuda's prisons "are not places of comfort by any stretch of the imagination". Senator Wilson continued: "My message today is to implore our young people not to engage in the kinds of activities which will result in them being sent here to Westgate to waste their lives. "I am also appealing to parents, family and friends to please take hold of your children, relations and peers." My initial intent for hosting this media briefing today is to dispel a few myths regarding the prison system that seem to be floating throughout the community. In recent weeks, for a variety of reasons, a scrutinizing spotlight has been directed at our local prison system. While I have sought to address each issue that has captured the media and the public’s attention head on – there seems to be one lingering mistaken criticism of our correctional facilities. I appreciate that this has existed, long before I had the responsibility for prisons. 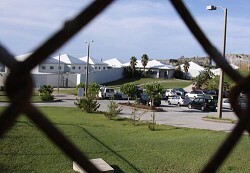 It derives from the erroneous notion that Bermuda’s prisons are places of comfort, that the living here is easy, and that individuals who commit some of the most heinous crimes in our community – the drug dealers, the violent offenders and the murderers – do not receive sufficient punishment that matches their crime. In fact, I’m told that the general view of Westgate Correctional Facility is that it’s a “Holiday Inn”. Like most societies we generally shy away from admitting to the harsh realities that prisons represent. At best they are accepted as necessary evils, and places where we lock away those who commit acts warranting our removing them from among us. So we are inclined to create myths about the places we confine them to mask the ugly truths their actions and consequences represent of our society at large. However, while Bermuda’s prison facilities do not rank amongst the most abysmal penitentiaries in the world, they are not places of comfort by any stretch of the imagination. While from the outside looking at it may appear differently, prison cells are standard-sized locked cages that keep men confined in limited spaces until they are allowed to roam in other confines under the watchful eyes of their guards. We Bermudians are travellers and I cannot imagine that it is anyone’s idea of a vacation to spend years confined to the square footage of prison cells and prison grounds, cut off from the rest of the territory of our already limited tiny island home. Not to mention interaction with the rest of society. This leads to a related matter that I am compelled to discuss today – a matter that is much fresher in our consciousness – and a matter that should concern us all greatly as Bermudians. While I can list a litany of issues that may divide us as a people – it is one issue that I can confidently say joins us as a community – and that is ridding ourselves of the threat of gun violence. Five days ago, our community was once again rocked to its foundation with the news that another murder had taken place, when Joshua Robinson was gunned down in broad daylight at a popular local establishment. For me, it’s important to address this latest incident in this surrounding because when justice prevails, Westgate is eventually where the individual (s) will rightfully end up. Unfortunately our society will suffer the twin tragedy of one life lost and another removed. My message today is to implore our young people not to engage in the kinds of activities which will result in them being sent here to Westgate to waste their lives. I am also appealing to parents, family and friends to please take hold of your children, relations and peers. Communicate with them, immerse yourselves in their lives to prevent them from going down this path and if necessary help us to bring them to justice so as to stop them from continuing down that road, or to lose their own life. On the preventative side, share with them that every life has value, worth and meaning. Remind them that living is about making choices and that making the wrong choice can lead to them becoming another Westgate statistic or a force for destruction in our midst that must be removed. Ladies and gentlemen, over the past week, you’ve heard from the Premier, the Minister of National Security, Assistant Police Commissioner Mirifield and his team, and Joshua’s family on just how much of a shattering effect such an incident can have on our community. But there’s another segment of the community that I think can perhaps assist in driving home the point about the devastating effects of making the wrong choices. They are here with me today. Individuals who have found themselves here at Westgate Correctional Facility for crimes they have committed. They will tell you first hand that their actions have had serious consequences including the loss of family, the loss of productive years, the loss of their rightful place in society and the loss of their basic freedoms as they know it. They will also tell you that life here at Westgate certainly isn’t a picnic - quite the contrary. For the most part, their home is four walls and a cot. When these security doors slam close – for some of our inmates – this facility is where they will live out the remainder of their years until death. In the meantime they will have to live the regimented life of incarceration where someone else determines their every move. It is appropriate at this time to single out our dedicated Prison Officers who go above and beyond to execute their duties on a 24 hour basis to ensure that they uphold their commitment to protecting and serving the people of this Country. Finally, I wish to close by expressing my sincere condolences to the family and friends Joshua Robinson. As a mother of a young son, my heart certainly goes out to his mother and to his children. I want to assure his family that this Government through the auspices of the Department of Public Prosecutions, the Ministry of National Security and the Bermuda Police Service, will do all that it can to bring those responsible to justice. I also want to appeal to anyone who may have any information about this latest murder or any other crime, to please contact the Police or Crime Stoppers and share what you know. We owe it to ourselves, our children and our country to do what we can to prevent a few among us from destroying our quality of life.